Buy Weleda Herbal Sage Deodorant Spray 100ml in the UK from our online shop or directly from our independent Scottish store. Where ordinary deodorants clog your pores and work against your skin, Weleda?s Sage Deodorant works with your body, neutralising odour with natural essential oils and letting your body breathe. In a choice of two sizes of refillable, recyclable glass bottle, using a non-aerosol pump spray, with no aluminium or other anti-perspirant minerals, we promise you freshness, naturally. Alcohol, Water (Aqua), Fragrance (Parfum)*, Ammonium Gycyrrhizate, Salvia Officinalis (Sage) Leaf Oil, Melalueca Alternifolia (Tea Tree) Leaf Oil, Limonene*, Linalool*, Geraniol*, Coumarin*. * from natural essential oils. As official Weleda stockist, we sell genuine Deodorants directly from our shop in Scotland and online throughout the UK. Weleda is the supplier of anthroposophic and homoeopathic tablets and natural, cruelty free bodycare products. View more products from Weleda. Where can you buy real Sage Deodorant 100ml safely online? If you are wondering where you can buy Weleda Herbal Sage Deodorant Spray 100ml safely online in the UK, then shop with us. We are an actual health foods shop; with real people selling real foods and products. Our award-winning independent shop is located in Stirling, Scotland since 1976. You can buy our Natural, cruelty free skincare. Homeopathic remedies and other genuine Deodorants in store or safely place an order with us online or over the phone. 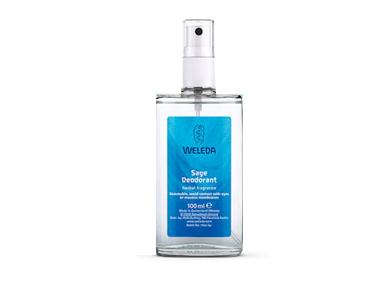 Sage Deodorant 100ml - Weleda Herbal Sage Deodorant Spray 100ml in Deodorants and Personal Care.